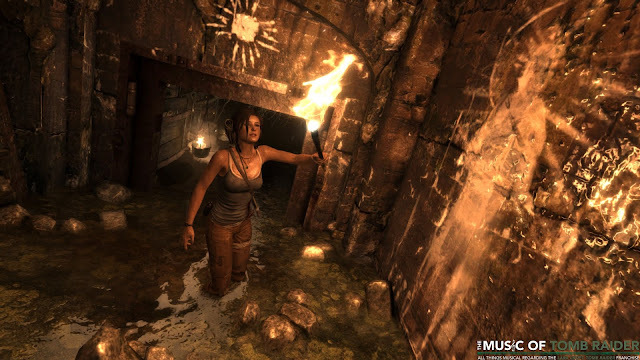 A long requested investigation has been finally conducted for our readers - details on the only externally licensed track from Tomb Raider (2013). Composer Jason Graves was even queried on twitter as to the origins of this piece - but it is the musical work instead of Markus Bravo. The haunting Japanese vocals play near the beginning of the game from a gramophone within a flooded bunker. "Akaro Female Vocals" from the Ryukyuan: Classical collection can be streamed at Audiosparx.com. Audiosparx acts as a licensing agent, distributor and publisher of music typically composed for use in advertising such as Hollywood trailers - serving as a vast library of readily available music and sound effects. "Akaro Female Vocals" was evidently purchased by developer Crystal Dynamics for commercial use within Tomb Raider. The piece is described as a "mysterious and exotic Japanese/oriental track, sparsely produced, emotional, poignant, quiet", with dramatic indigenous female vocals likely to have been chosen for their Japanese timbre in relation to the game's fictional setting of Yamatai. Lara memorably asks "Music?" upon descending into the bunker located in Tomb Raider's Coastal Forest. Loosing an arrow into the gramophone even stops the tune from playing. While proven popular, unfortunately the track is not available for personal purchase (it can instead be licensed commercially for around US$80). Thanks to our readers who suggested this rarity! Rare yes. Perhaps... TOO rare.